As a lord of one of the most powerful families in 15th century Italy it’s up to you to build the dynasty that will one day rule the entire country. Will you succeed or will your family only be remembered as a footnote in the history books. 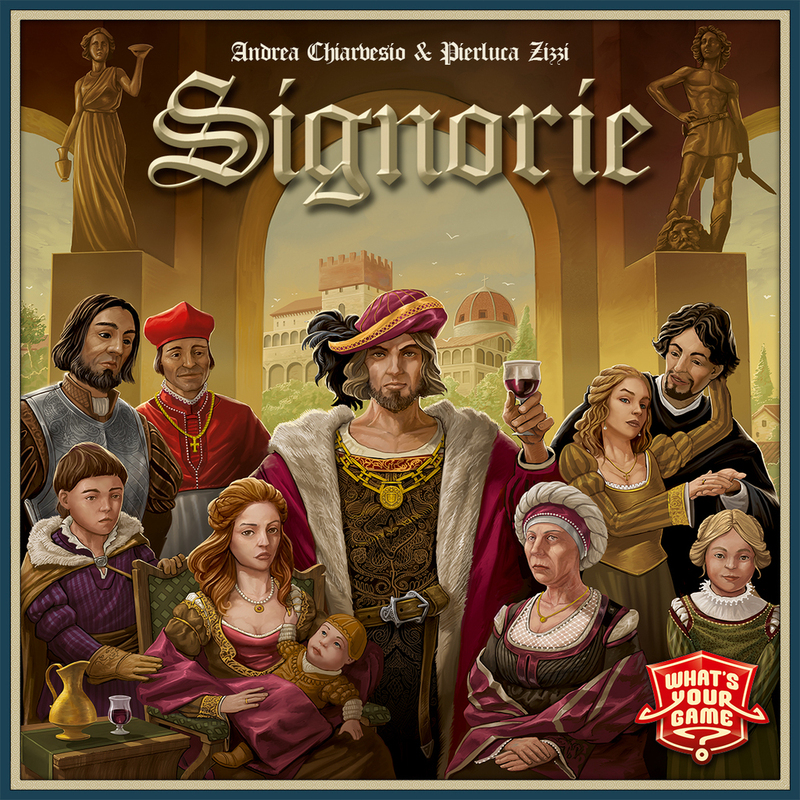 In Signorie each player takes on the role of a lord of a big Italian family during the Renaissance. These men are known as Signorie, and as a Singorie it’s your destiny to make your family the most powerful, the most prestigious and the most feared through all of Italy. To achieve all of this you will need to oversee your sons and grandsons career in politics, the church, or the military. Sending them of on important diplomatic missions when the time is right. At the same time you’ll have to make sure your daughters and granddaughters are married off to important rival families. In Signoire this is done by selecting a multitude of actions, from advancing your offspring on the different career paths, marrying them off, and sending them on diplomatic missions. All of this will in the end give you different amounts of victory points, and of course the player with the most of them at the end of the game will be “crowned” the winner and will rule all of Italy. 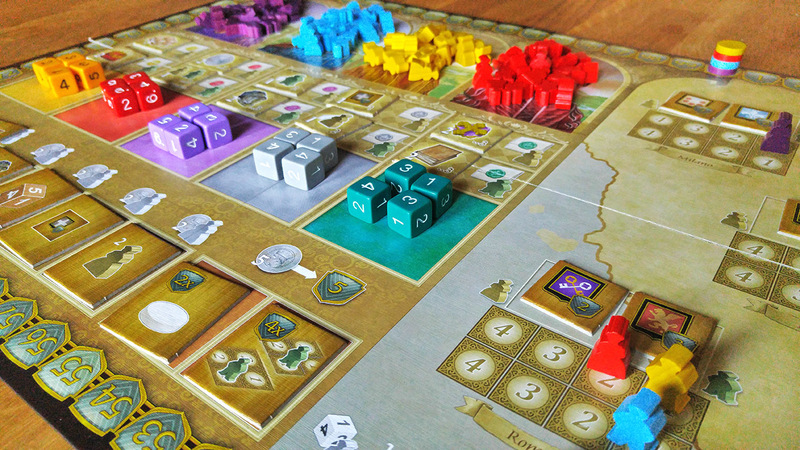 What makes this game different from other worker placement games (where you simply place a worker and take the action allowed by that spot) is the fact that this game uses dice, five different coloured dice to be exact. At the start of each of the games seven rounds the dice are rolled and placed on the five different actions spaces they belong to. Players now take turns taking a die of a given colour and takes the actions associated with that. The higher the value on the dice the bigger a discount you’ll get on doing the action. So you would think that the high value dice are always better, but that is far from true. Because you want the total of all the dice you used during a round to be no greater than 13 in total, to get an extra (and very powerful) bonus. Getting this bonus will not be easy, since you will have to pick low numbered dice and pay more to do the actions (and the money is really tight in this game), or even pass on taking all of the 5 actions you could have in a round. In addition to taking the main action for the colour dice you have the option of choosing several other “support” actions that can help you out in various ways. These support actions along with the bonuses you get for not having a total of more than 13 on your dice, are all placed randomly at the start of the game, so it does make every game different. Signorie is without a doubt a well put together game. It has a simple core with the dice rolling and actions selection. This gives players lots of interesting choices. On top of this there are a lot of added mechanics, most which are very thematic. Some of these can feel a bit overwhelming (especially at first) and you could argue that the game is a little overly complex. Still I like it and everything works very well together. Once you get a hang of all the different things you can do in the game it’s very enjoyable to play. It does take some time to get into, so the first game is a little less fun to get through, but after a few games everything runs very smoothly. This is definitely a highly thematic game. Most of the actions you take are tied to you being the lord of your family and assigning your children and grandchildren at exactly the right time to get the most influence (and victory points). The cover of the game looks good, and the rest of the components are ok, they are functional and not to flashy. I do feel the overall aesthetics of the game feels a little dull. Overall the quality of the game is good. 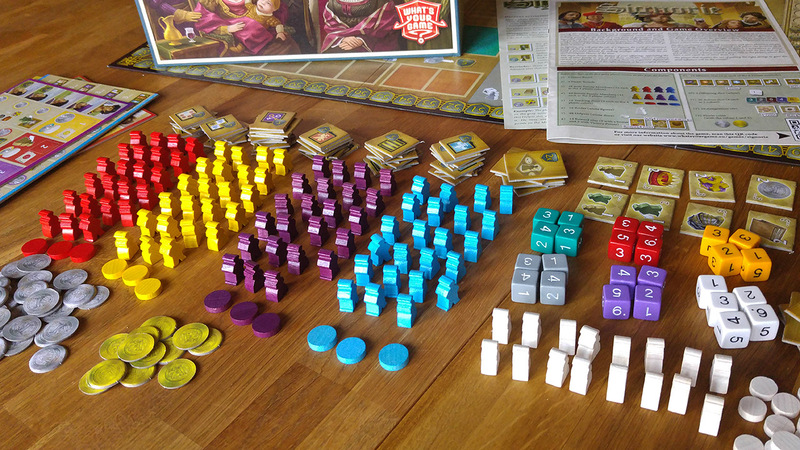 Nice well written rulebook, nice component quality, custom coloured dice and custom meeples. The rulebook can be a bit daunting to read through, and there is a lot of things going on in the game. But once you understand them and the iconography, the game doesn’t feel overly complex. Give it a few games and it will all run smoothly.